Ryne Sandberg is one of the most iconic players in the history of the Chicago Cubs and was the face of the organization for much of the 1980s and 1990s. A force at the plate and in the field, Sandberg ended his 16-year career as the home run leader among second basemen. "Ryno" was also one of the most popular players with baseball card collectors during the 1980s and 1990s. This top ten list looks at the best baseball cards of this Cubs legend. Shop for Professionally Graded Ryne Sandberg Cards on eBay. Sandberg's career started out in the Philadelphia Phillies organization where he briefly appeared for the team at the end of the 1981 season. After a trade to the Cubs, Sandberg immediately became a star for the team. He helped lead them to the National League East title in 1984, picking up the National League MVP in the process. The 1984 team also ended a 39-year postseason drought for the Cubs. Sandberg would take the team to the playoffs again in 1989, starring alongside fellow Hall of Famers Andre Dawson and Greg Maddux. Sandberg was an extremely popular player throughout his career and his visibility was greatly enhanced by the Cubs frequent afternoon baseball games that were broadcast nationwide on WGN. When his career ended in 1997, Ryne Sandberg had been named to ten National League All-Star teams and was awarded nine Gold Gloves and seven Silver Sluggers. After his retirement from baseball, Sandberg was inducted into the Baseball Hall of Fame in 2005 and became just the fourth Cubs player to have his number retired by the team, along with Ernie Banks, Billy Williams, and Ron Santo. 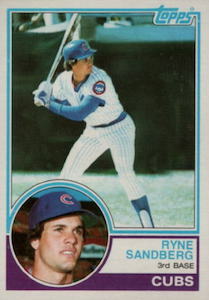 Ryne Sandberg's first rookie cards were issued in the 1983 products, but he also had numerous oddball and minor league cards made prior, which are highly sought-after with collectors. Ryno was one of the most popular baseball stars during the 1980s and 1990s card boom, making him one of the players with an extremely diverse variety of options for collectors that ranged from high-end autographs, memorabilia, and low-print chase cards, all the way to junk-wax commons. There is literally a Sandberg card for collectors at every price point. Even though he has been out of the league as player for many years, Ryne Sandberg remains a popular option for collectors even after his retirement. He is still a frequent subject in different card sets, but many collectors still enjoy collecting his older cards, some of which offer a good challenge. His entry into coaching and managing has also increased his visibility to the newest generation of collectors, reinvigorating the push to collect the cards from his playing days. 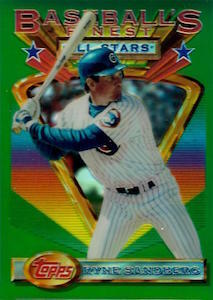 The following guide looks at ten of the best Ryne Sandberg cards. This list highlights cards from his entire career, ranging from his pre-rookie and rookie cards through modern releases which have shown his continued popularity with collectors of all ages. The 1990s Metal Universe products were some of the more unique looking base sets of that time period. Baseball players with lasers shooting out of the their eyes, city skylines, space scenes, and ominous-looking tentacles wrapping themselves around players were just some of the designs used on these cards. While they are not the most expensive cards, and not the hardest to find, many player collectors enjoy their uniqueness. 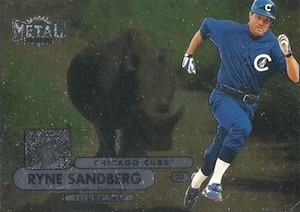 The 1998 Ryne Sandberg Metal Universe featured the Hall of Fame second baseman with a rhino in the background. Ryno card enthusiasts have long approved of this card. Collectors with a little more money, and a little bit of patience, can try to track down the Precious Metal Gems parallel of this card which is serial numbered to 50 copies. The Canon Chicago Cubs cards are a very popular oddball product with collectors. The 5 1/2" by 3 1/2" cards were given to players by the team to use in answering fan mail. Some of the cards were signed by the players and handed out as intended, but others went unused or unsigned and these have become great chase cards. 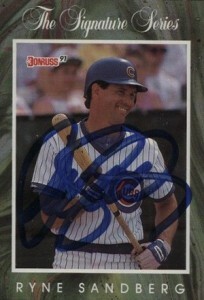 One of the most popular options in the Canon Cubs cards is for Ryne Sandberg. Clean copies are in high demand and offer collectors a chance to own a unique collectible for the Cubs second baseman. Sandberg was not included on any memorabilia cards until the summer of 2001. There were several different relics of the Hall of Famer issued that year, but his Topps Archives Reserve is still one of his most popular memorabilia cards. Topps designed the set around previous cards of the player with a piece of relic located somewhere on the card. For Sandberg, Topps used his rookie card and a piece of bat. While this early Ryno relic is plentiful, it definitely carries a premium with collectors. The 1993 Finest card set represented Topps' initial venture into super-premium baseball cards. More than decade later, the cards are still highly desired by collectors everywhere. The most popular cards in the 1993 Finest product are the Refractor cards. Collectors of modern baseball cards are very familiar with the Refractor-concept used by Topps across many of their products, but the Finest set was the first set to use this innovation. The Refractor parallel cards came roughly one per box, but the odds were never officially stated. The Sandberg Refractor has been a popular choice amongst his collectors with graded copies of this card demanding a fairly hefty price tag. The 1991 Donruss Elite set is considered one of the best early insert sets. Collectors are still chasing these cards down today, and while modern collectors might view the print runs of 10,000 copies as a high number, the cards can be tough to track down. 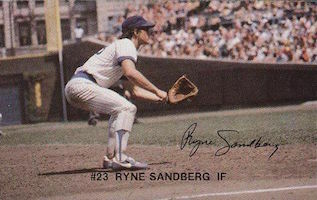 The Sandberg card in the set was even tougher to pull at just 5,000 copies, but collectors were rewarded with an autograph of the Cubs star when they pulled his card. Although there are many other choices, this remains an extremely popular card with collectors as his first certified autograph card. Collectors looking to add copies of Sandberg's rookie cards have several options. His 1983 Donruss card is widely available and affordable. Even graded copies of this card are light on the wallet considering you are getting the rookie card of a Hall of Famer. It also doesn't hurt that the 1983 Donruss set includes rookie cards of Tony Gwynn and Wade Boggs, adding to the interest of this great 1980s baseball card. TCMA made some terrific minor league sets during the early 1980s. While the cards often had a very simple design, they did a great job of including a wide variety of players and teams. 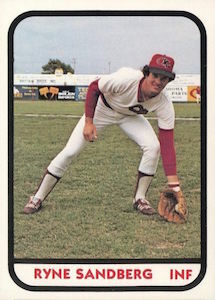 The early 1980s TCMA sets featured minor league cards of legendary players such as John Elway, Cal Ripken, and Don Mattingly, and many of these cards fetch prices far beyond the mainstream rookie cards of these players. 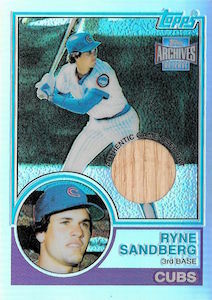 The 1981 TCMA Ryne Sandberg card also carries a premium, but is not too difficult to locate. Collectors looking for a little bit more of challenge can also try tracking down Sandberg's 1980 TCMA card with the Reading Phillies. The 1983 Fleer rookie card of Sandberg has always been popular a choice with collectors because of the simple design of the set and a nice action shot. While both his Topps and Donruss rookies feature the second baseman batting, the Fleer rookie card shows Sandberg leaving the batters box after swinging the bat. 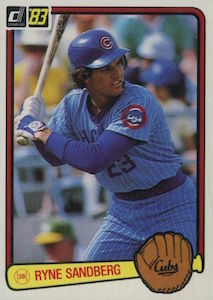 The full view of the early 1980s Cubs blue road jersey also helps the popularity of this card. 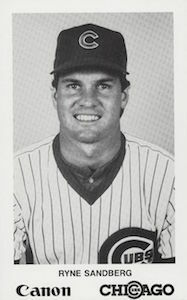 Sandberg's earliest Cubs card came towards the end of his debut season with the team. The Red Lobster cards were a giveaway at Wrigley Field and the full-bleed cards feature action images with the players name printed across the bottom along with a facsimile signature. 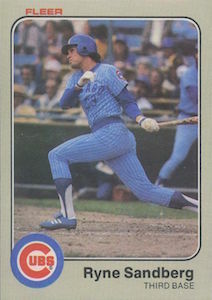 The card is not only Sandberg's first as a Cub, but also shows him playing third base, which is where he originally played when the Cubs first traded for him from the Phillies. The Cubs would later move him to second base after trading for Dodgers third baseman Ron Cey. The 1982 Red Lobster is highly sought-after and can be one of the pricier options for collectors looking for Ryne Sandberg cards. Sandberg collectors have always had a wide variety of early cards to pursue, but the most popular option has remained his 1983 Topps rookie card. The card is readily available and affordable, just like his Donruss and Fleer rookies. The design of this Topps set has long been a favorite with collectors. This Sandberg rookie features two pictures of the Hall of Famer, a small circular portrait, and a larger action shot of him batting. Graded copies of this card are in high demand, with high-grade versions being one of the pricier cards from the 1980s. 1988 Topps Tiffany Baseball Cards #1-250 You Pick! RYNE SANDBERG BASEBALL CARDS - ALL IN EX-MINT CONDITION - CUBS!